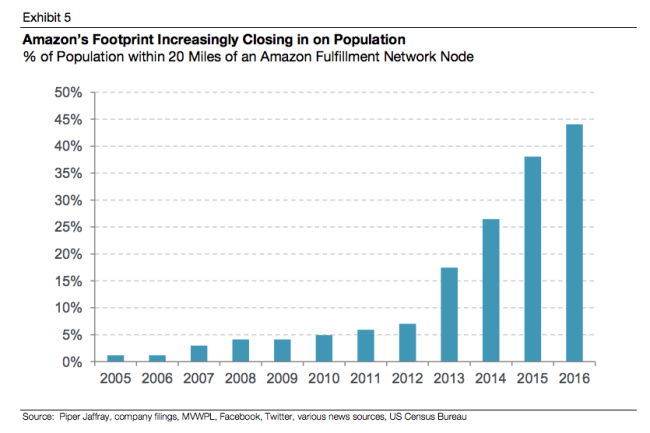 We’re not there just yet, but Amazon is getting closer. And, for a growing percentage of the US (and European) population it is already true. “We believe this gives Amazon a critical competitive advantage now that it has acquired so many Prime users in the United State: same-hour and same-day delivery can structurally replace trips to the store,” PiperJaffray’s analyst Gene Munster wrote in the note. One has to understand that for that to happen people don’t have to completely stop going to the stores. They just need to reduce their store shopping by a high enough percentage to bring down the traditional retailers like a house of cards. This is the downside of scale effects: Once a retailer has reached a certain scale they can leverage that scale to, for example, get better prices at their suppliers. The insidious consequence of this is that after a short while the retailer ‘gets used to’ those scale effects. They incorporate them into their cost structure and business model. Because why wouldn’t you? After all, how could you lose that scale again? This doesn’t happen over night.